The latest red-hot romances from Mills & Boon Modern! 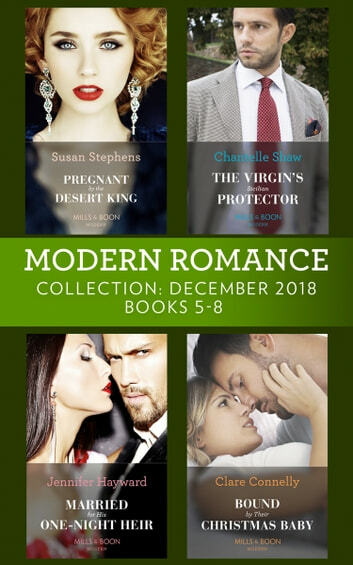 Pregnant by the Desert King by Susan Stephens Pregnant and alone, Lucy Gillingham is determined to protect her unborn child from her volatile family. Then Tadj, the enticing stranger she spent an unforgettable night with, returns with a royal revelation…Lucy is carrying the baby of a desert king! Tadj will secure his heir, but can Lucy accept his scandalous solution – that she share his royal bed? The Virgin's Sicilian Protector by Chantelle Shaw Hired to keep heiress Ariana Fitzgerald safe, wealthy bodyguard Santino Vasari was expecting to meet a pampered princess. Yet beautiful Ariana intrigues him with her hidden vulnerability, and captivates him with her spirit! Alone in Santino’s secluded Sicilian farmhouse, their simmering sexual tension is electric. And when Santino discovers just how innocent Ariana is, resisting her temptation becomes an impossible challenge… Married for His One-Night Heir by Jennifer Hayward Commanding Santo Di Fiore is stunned to see Giovanna Castiglione again. Her unexpected appearance at his luxurious party in the Bahamas leaves him craving answers. Why, after that one forbidden encounter, did she leave? But when Gia reveals the secret consequence Santo won’t let her go a second time. The Italian will claim his son—and Gia as his wife! Bound by Their Christmas Baby by Clare Connelly When brooding bachelor Gabe Arantini learns the innocent beauty he shared a steamy festive night with is the daughter of his business rival, he’s furious. The following Christmas, Abby returns with shocking news – she’s had his child! Gabe knows he must marry Abby to legitimise his son. But can this be a marriage in name only, or will their red-hot chemistry take over?